With the launch of its second popup shop in New York, women’s accessories startup BaubleBar teamed up with design and development firm Gin Lane to explore a new challenge faced by modern retailers: given the impact the Internet has made on how we shop, how can the digital world augment a traditional in-store experience? Most in-store displays today act like smart banners; they either exist for branding purposes only or function as interactive ads. But recently, it’s become increasingly common for stores to experiment with everything from giant, Windows-powered touch displays to the all-familiar iPad. The goal of this experimenting isn’t to look ultra modern or to blindly throw around cash, however. Bringing digital experiences into physical spaces has a certain allure to it. The promise of increasing engagement and empowering customers makes it a very attractive idea, and even if it’s tough to implement, in-store shoppers are worth targeting. If you’re unfamiliar with BaubleBar, it’s a fashion ecommerce startup focused on women’s accessories. 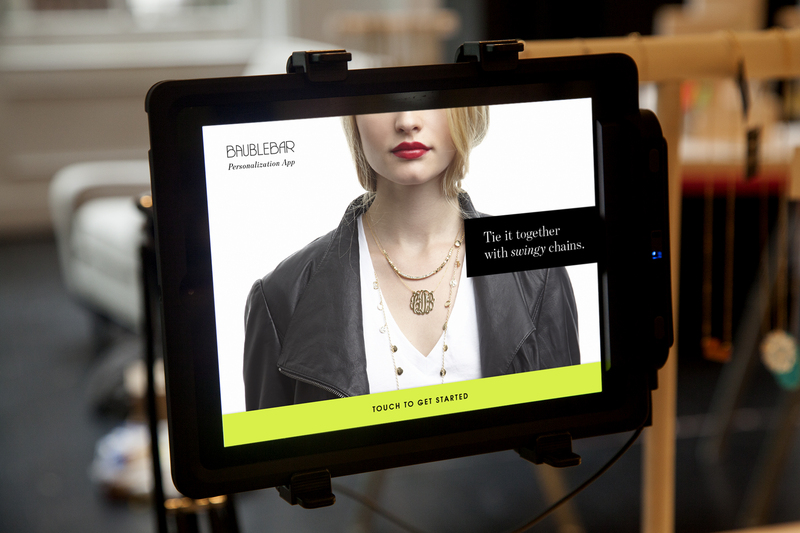 Like Warby Parker, Birchbox and Bonobos, BaubleBar plays a dual role in the fashion and tech scenes. 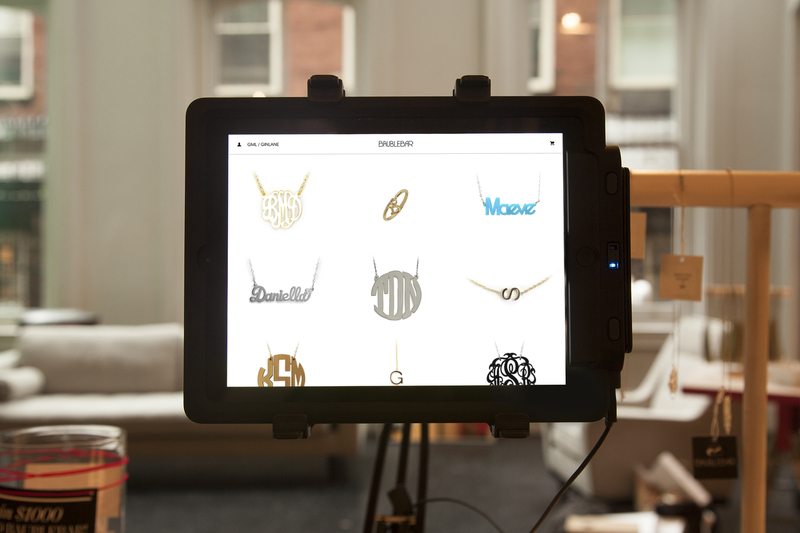 For BaubleBar’s 4,000-square-foot Soho shop, Gin Lane stuck with the iPad and built a native app specifically designed for in-store use. Sitting in BaubleBar’s custom jewelry section, the app lets users customize the design, colors, materials and size of various accessories, including necklaces and rings. As you explore different designs, a preview of your jewelry is generated on the fly. To build it, Gin Lane tapped OpenGL for 3D rendering, Stripe for payments, Linea InfineaTabs for card reading, and SpreeCommerce for product management. We made a Gif (below) to show the Web GL animations in action. 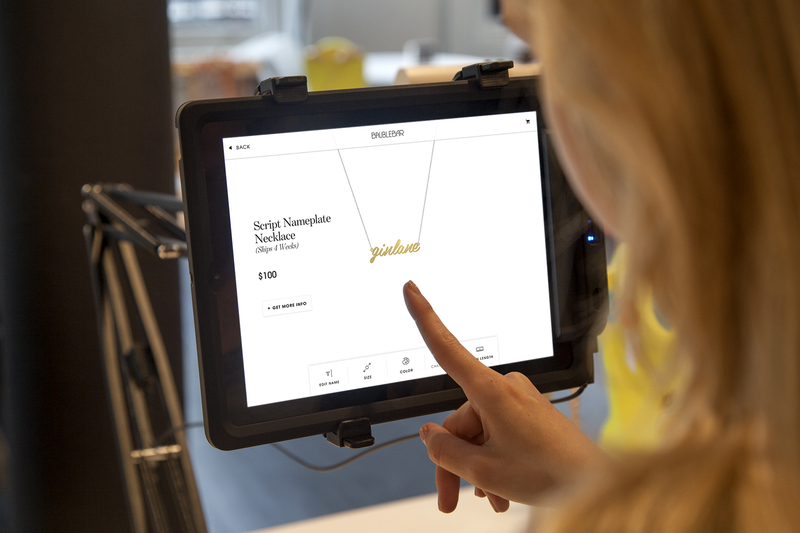 iPads tend to feel like an afterthought in retail experiences — like they’ve been tacked-on arbitrarily — but BaubleBar manages to pull it off. This is in part because the startup sells both pre-designed and custom jewelry, and the latter couldn’t fully exist offline. In other words, the secret to successfully integrating touch computing into a physical space may just be that stores need a reason to do so in the first place. Additionally, because BaubleBar’s offerings are primarily online anyway, digital fits right at shop. For Gin Lane’s implementation, we consider it a job well done, but there’s an overwhelming feeling that this sort of interactive experience is still in its early stages. A lot more that can be done to blend together the digital and the physical, and as technologies emerge (and prices drop), shoppers should expect to encounter new ways of displaying and interacting with products in a physical store. The growth of digitally-conscious brands will only drive this further — companies that realize how to take advantage of interaction design, without letting it get in the way.